Any business which tends to evolve, gain popularity, and spread its activities to other countries, will sooner or later face the need to adapt its website or portal to the linguistic peculiarities and culture of the target market. This adaptation process is called “localization” (often referred to as L10n). Softengi has delivered its in-house automated solution for localization of enterprise applications – Localization Studio (LocStudio). It is intended to be used by anyone involved in the localization/internalization process, i.e. developers, translators, test engineers, or management. Dealing directly with the source code, this application simplifies and speeds up localization process tenfold. Let’s consider a typical website. The initial version of it is English, and we need to produce its German version. Traditionally, a developer would have to code pages for this new version “from scratch”. Instead, one can save time and perform interface localization using extensive LocStudio functionality. 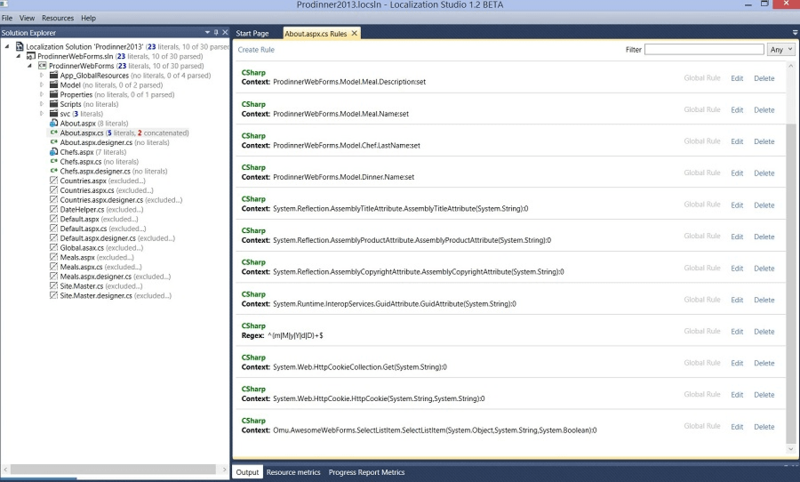 The process starts with uploading all localization project files into LocStudio. 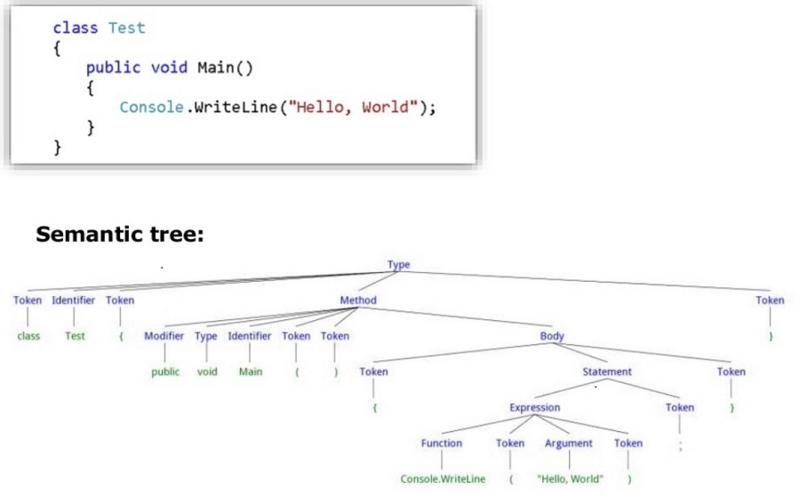 Then the application parses the source code of these files in search of literals (a literal is a line with text in quotation marks), highlights them, and we get a semantic tree (see Picture 1). In his/her turn, the developer can set custom rules for filtering non-localizable literals, manually adding wrongly highlighted literals to the list (see Picture 2). 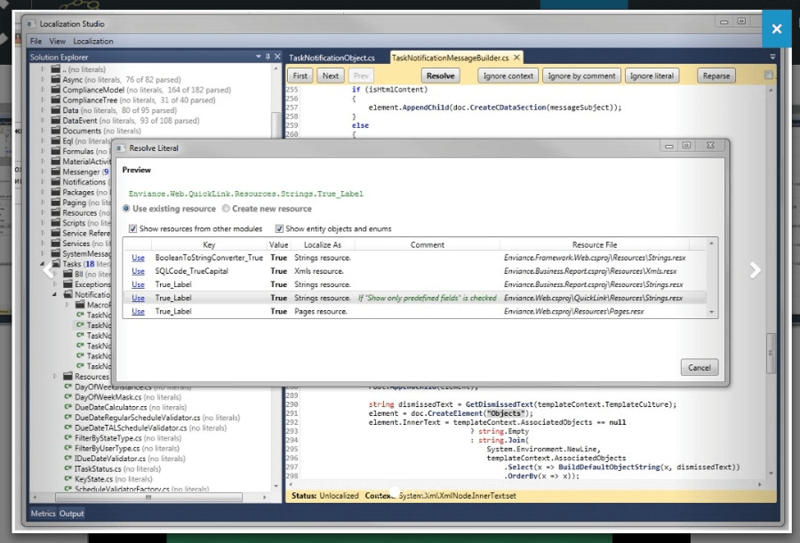 LocStudio automatically reviews the code and excludes all repetitions (see Picture 3). Finally, there remains a set of literals which need to be localized, and the developer knows the exact volume of work to be done. Further, the set of localizable literals is extracted from the initial code to a resource Excel file (currently, there is a mechanism in development which allows the simultaneous extraction of a large number of literals (50 or more) to the resource file with a single click). The resource file contains two columns: key (a short name of the value) and value (the content that needs to be translated) (see Picture 4). This file is then forwarded to a translator. After the translation is complete and the target language column is filled, the translator sends the file back to the developer (see Picture 5). LocStudio has one more useful feature: in case no translations are available yet, it is possible to generate temporary fake translations, which can be later substituted with real translations. Finally, the file containing the target language is imported back to the LocStudio and can be deployed on Windows or used independently to make the target language (e.g. the German) version of the website. As a result, one gets a fully localized web application spending minimum time and resources. However, our developers are forging ahead. For instance, they are currently working on the LocStudio feature allowing to distribute localization of large projects among multiple development teams and track the whole localization process, e.g. in the form of a graph showing the time (as X-Axis) and the number of non-localized literals (as Y-Axis). LocStudio simplifies the work with resource files and localization process as a whole. Without it, a developer would need to search for each source literal separately, review, copy and move it to the resource file. Therefore, this software fully automates developer’s routine job. If you are interested in scheduling a meeting with those responsible for LocStudio Project, want to inquire about Softengi projects, or just need an initial consultation, please send us an email to marketing@softengi.com.